Here at Reynolds Community College four-year university students often attend classes during their summer sessions. Initially one would think, “Why would a student, who was accepted at a university, take classes at a community college?”, and after several interviews a variety of answers to that question have been revealed. Featuring Emma Maiden from Longwood University, Breana Washington from Virginia State University, and Abbey O’Farrell from Virginia Tech. Below are the interview questions asked and the student’s responses. Emma’s answers will be noted by EM, Breana by BW, and Abbey by AOF. BW – I attend Virginia State University in Petersburg, Va.
How is transportation to Reynolds, or do you attend distance classes without moving from your main location? EM - The drive to Reynolds from my house is relatively short. I really appreciate the free parking passes here rather than $250 a year for parking at Longwood. BW - I am taking one class on the Parham Road Campus, and 3 courses online. My 'in person' class is from 8 to 10:10 a.m., Monday - Thursday. I drive myself every day. AOF - I attend a distance Biology class that requires one on-campus laboratory meeting per week. What is your housing method? As an example, are you still at your main institution, or are you housed with family? EM – During the summer, I live with my parents. At Longwood I am currently living in University Managed off-campus apartment. BW – I live off campus, I have my own apartment near the campus. AOF – During the academic year, I live in an apartment near the Virginia Tech campus, but while taking summer classes at Reynolds, I stay with my parents in Richmond. Why are you taking summer classes, and why choose Reynolds for them? EM – I choose to take summer classes at Reynolds during the summer semesters, because it enables me to graduate from Longwood on-time/early, it saves me money, and it is conveniently close to home. BW – I am taking summer classes to knock off a semester so I will be able to graduate next May. I have taken multiple classes at Reynolds, the Parham Road Campus is very close to my mother’s house. AOF – I am taking summer classes to get ahead on my bachelor's program. Reynolds is close to my home. From your experiences from taking classes at Reynolds, do you enjoy them? Why? EM – So far I love my class at Reynolds. The class sizes are generally smaller here and always seem to be taught by teachers (not teaching assistants, etc). BW – I do enjoy them. I have never had a professor here that has not wanted the best for each and every student in their class! That alone means so much they will always do whatever it is to help you succeed. AOF – It has been a challenge adapting to a new software interface, since my home institution does not use Blackboard. Would you recommend to your fellow students or friends to take classes here? EM – Yes, I (would) definitely recommend my fellow students to take classes at Reynolds. I have convinced two of my fellow classmates to take classes this summer at Reynolds because they were worried they wouldn't graduate on time or have to take too heavy of a class load to graduate on time. BW – I would and I have recommended my friends to take classes here that have not gone back to their 4 year institutions, just to keep their interest in school in case they are motivated to go back into a four year institution. AOF – If they are looking to get ahead, yes. Have you noticed any differences between your current institution and Reynolds? If so, what are they? Would you recommend attending Reynolds for a student’s first two years? EM – I have noticed a difference in the personalities of teachers at Reynolds. The teachers I have met at Reynolds are all very personable and are very understanding of students with children, jobs, and responsibilities outside of their education. The students have a lot of respect for those understanding teachers and appreciate them for it. This is not always the case with other schools. Many of my friends from high school attended Reynolds for two years before transferring and really enjoyed it. At Longwood we are required to accomplish 12 general education "goals" and sometimes it takes more than one class to accomplish one goal (e.g. Foreign Languages). If I had attended Reynolds for two years (accomplishing most of my general education goals) and then transferred, I would have been stuck taking all the upper level classes required for my major and it would have been very difficult (although very possible). Longwood encourages students to take their general education classes throughout their four years to avoid becoming overwhelmed with difficult upper level classes required for their major at the same time. BW – Reynolds is honestly just like a four year institution except it doesn't have all of the distractions that a four year college does. The work load is the same and the benefits of coming to a community college first is that you will get your associates degree and then you still have the option to transfer to get your undergraduate or bachelors. It is also cheaper and you save money and it gives you time to mature and learn about yourself and your study habits, because whether you go to a four year or two year college, it is a lot different from high school. I would recommend it. I did not come to J. Sargeant Reynolds to start off my college career but it is not a bad idea. Especially if they have a program that you want to get a degree in and a possible career in. I did, however, leave my four year college after the first year and start classes at Reynolds before I transferred back to Virginia State. Reynolds gave me the opportunity to continue my education even when I didn't know exactly what I wanted to be when I grew up, but since then I have figured out exactly what i wanted to do and I am now on track to graduate next May! There is nothing in particular that I would change about this community college, everything is done very professionally and everything is easy to follow. AOF – I think that people at Reynolds take a lot of responsibility for their education and do not take it for granted. Reynolds Great Expectations students Sophia Booker, Jasmine Cook and Shakeema Isaac were recently honored with a $1,000 Momentum Scholarship from the Virginia Higher Education Fund. Through its Momentum Scholarships, the Virginia Higher Education Fund encourages students who have experienced challenging life conditions to push past obstacles and achieve success in higher education. The Great Expectations program helps young adults, those who are or were recently affiliated with the Virginia Foster Care System, transition to college. More than 500 children in the Virginia foster care system age out each year. Without social or family support, foster care children experience significant challenges living on their own. However, with access to education, foster care youth can find satisfying, well-paying jobs. 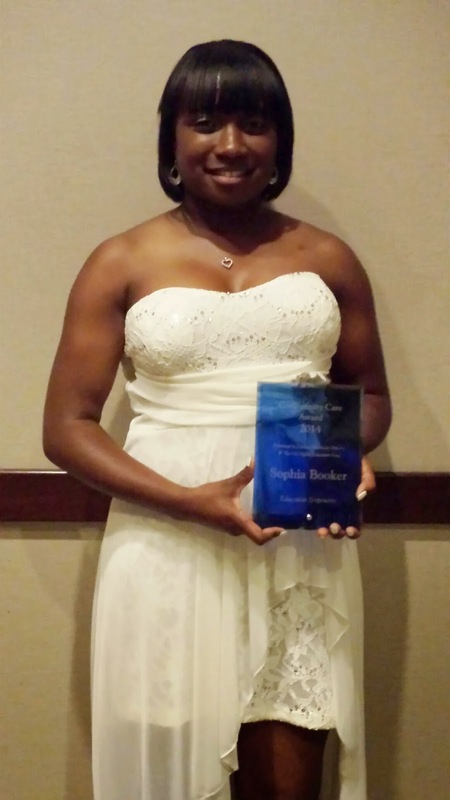 Sophia expects to graduate from Reynolds in December, 2014 with an Associate Degree in Social Sciences. In addition to working part-time in the Admissions Office at VCU, she was recently hired by Project LIFE as the Youth Network Coordinator. Shakeema received her Career Studies Certificate from Reynolds in May, 2013. 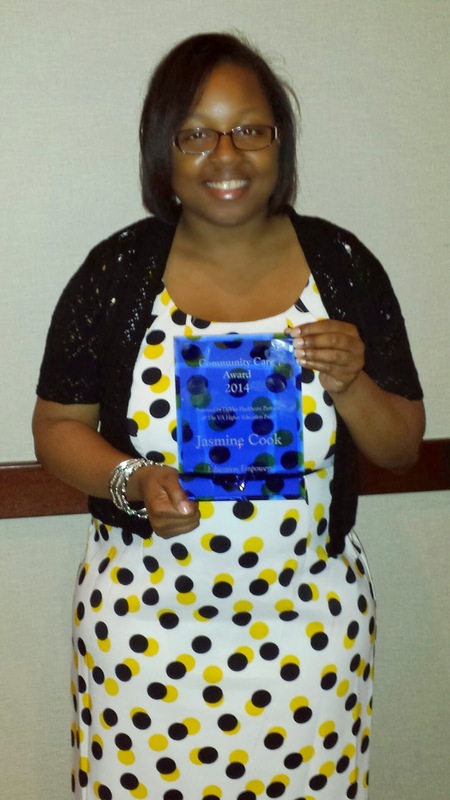 Her Great Expectations mentor, Nina Wells, is an owner of Kingdom Publishing Group. 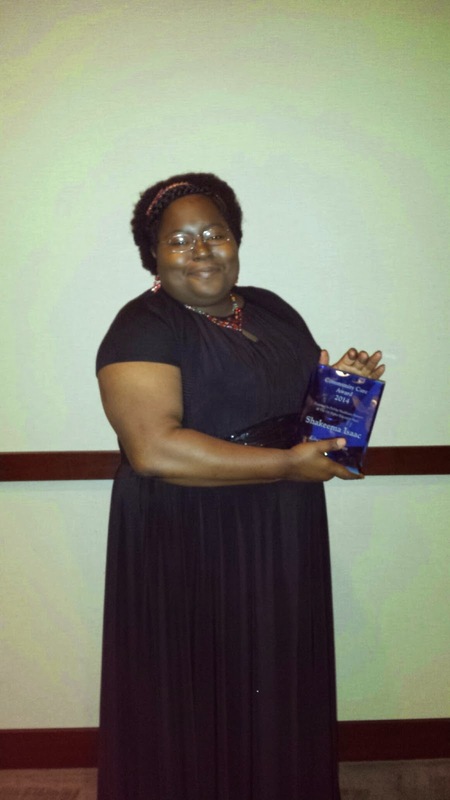 In May 2014, she and her mentor hosted a blogtalkradio.com segment where they shared the plight of youth who age out of foster care. Shakeema, the founder and owner of Love Yourself Graphics, will start at VCU this fall majoring in Mass Communication. Congratulations to all three scholarship recipients! 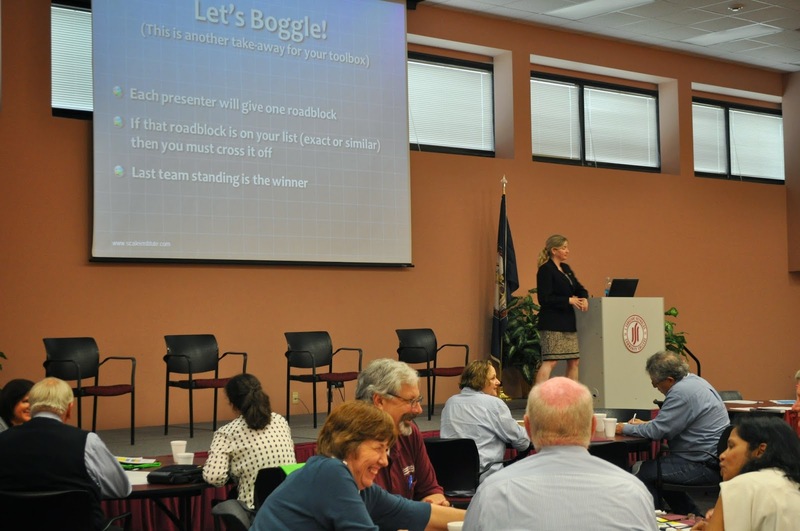 Virginia Director of STEM (Science, Technology, Engineering and Math) Dr. Megan Healy recently visited the college to share her presentation “Cooperative Learning is a Good Fit with Learning Communities” with the Reynolds Learning Communities faculty. A learning community is when two (or more) course sections in the same semester are linked together and the same students enroll in both course sections. Professors work together to coordinate assignments, content, and improve crossover learning between the courses. Benefits for Reynolds students include convenient scheduling, shared assignments and topics, support systems, the courses still meet the requirements for students’ majors. There’s no additional cost for taking a learning community as compared to taking the classes separately. Dr. Healy previously taught biology at Patrick Henry Community College in Martinsville, and subsequently played a leadership role in the Virginia Community College System’s re-engineering effort to improve student success and streamline developmental studies in community colleges throughout the Commonwealth. The Learning Communities mini-summer institute included a number of rich sessions designed to assist learning communities faculty with creating activities and assignments leading to improved student engagement, retention and success. During the session, Reynolds Learning Community Facilitator and English professor Karyn Pallay also led a session on Developing Critical Thinking Skills – an essential competency in any academic discipline and for successful living. Miles McCrimmon, Steve Brandon, Carolyn Quenstedt and Jena Morrison participated in a faculty panel to discuss successful learning community strategies for both in- and out-of-class activities. Learning Communities faculty were also provided with time and guidance for planning their teaching collaborations and several facilitating exercises developed by the Washington Center for the Improvement of Undergraduate Education at The Evergreen State College were enfolded into this session. To find out more about Reynolds Learning Communities, visit Reynolds.edu/LC. Have you seen the Nissan LEAF? 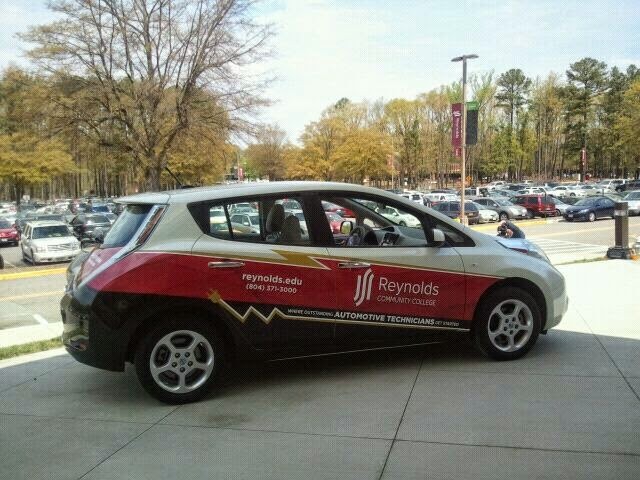 If you find yourself on the Parham Road Campus before June 10, be sure to take a few minutes to look around campus to see if you can spot the 2011 Nissan LEAF sporting the Reynolds signage. The LEAF is an all-electric vehicle with lithium-ion batteries with a driving range of 80 miles per charge. This electric vehicle was purchased as a teaching aid and/or tool for the Advanced Automotive Technology Career Certificate Studies program. It will be used in the automotive labs for student instruction on vehicle safety, electric vehicles and electronic controls. As a secondary purpose, the car will visit area schools and community functions to promote the Advanced Automotive Technology program. In fact, you may catch a glimpse of Dr. Rhodes driving the LEAF to meetings on any of the Reynolds campuses in the next week or so. With the growing number of charging stations being installed in the greater Richmond area, the LEAF can park and charge in lots of places, and always be ready to go. Plans are in the works for Facilities Management to oversee the installation of two public charging stations on the Parham Road Campus in the near future, so be on the lookout for other EV’s charging up on campus. Thanks to the folks in the automotive program in Goochland Campus for giving us all a chance to get a glimpse of this new and exciting technology.